At 11:00 a.m., we left for a swimming cove not far from the island of Los. It was another brilliantly clear inlet and we lunched, swam and water-skied. We left at 6:00 p.m. and entered the harbor of Los at 7:15. The harbor was exceptionally busy. A sailboat regatta was in progress and many beautiful racing sailboats were moored at the main pier of Los. Throngs of people milled about and there was festive and somewhat boisterous activity throughout the evening. Two huge ocean-going yachts were anchored in the harbor and inflated rubber boats with powerful outboard engines raced from the quay back and forth to the ships. We were told by Kosta, the steward of the Daphni, who seems to know everything, that these two super luxury ships belonged to two brothers (Greek shipping magnates). The Houlandris brothers. We strolled along the quay and went into shops where a number of us made purchases. The tavernas were full and along the pier, the various crews on the slender graceful sailing boats shouted and joked with one another. There was an international representation in the race with boats coming from England, USA, France, Germany, Italy, New Zealand, Greece, etc. It is probable that we would have had a clearer notion of the island of Los had not this regatta been in progress. It did however add to the variety of the experiences we have had. After dinner on board the Daphni, we returned to Los for a stroll, stopped at a little night club for a few moments and then returned to the Daphni. 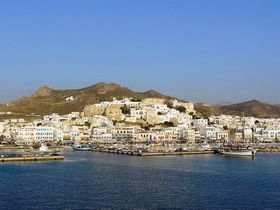 Up at 6:30 a.m. We were underway for the island of Naxos at about 8:00 a.m.
We arrived at Naxos harbor at 10:00 a.m. It was very sunny and quite hot. On a high mound jutting out at the mouth of the harbor, stands the rectangular form of the remains of The Temple of Naxos. Two massive columns and an equally massive monolithic lintel rise up, solemnly, from the plateau of the temple floor. Since digging is still going on here, our visit was limited to walking around these remains but not of entering a perimeter, which the archeologists had marked out. 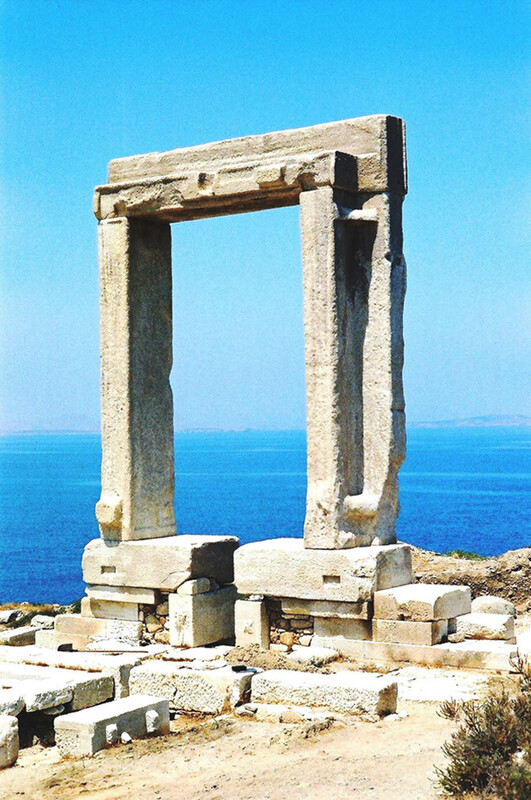 The views through this archway were all notable and in characteristic fashion; the temple must have harmonized yet been dominant in this striking site. We walked along the quay of Naxos. Apart from a remarkable, almost miniature Byzantine church sitting on its equally small separate little island just off shore from the quay, there was little of interest. 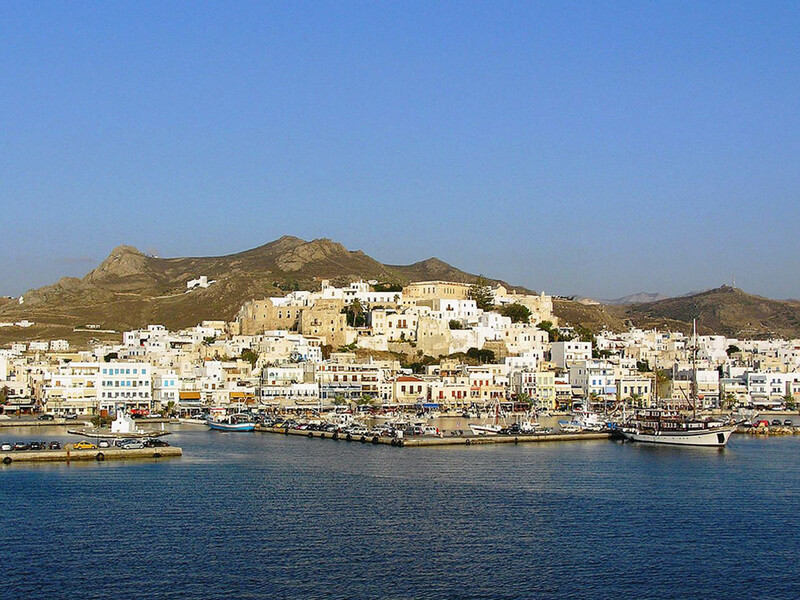 Captain Andreas had told us that the more appealing aspect of Naxos was to be found on the other side of the island. This would have required approximately four hours of driving accounting for going and return. By 12:30 p.m., the Daphni was ready to leave and so were we. We found a pleasant inlet in which we could lunch, swim and water ski. 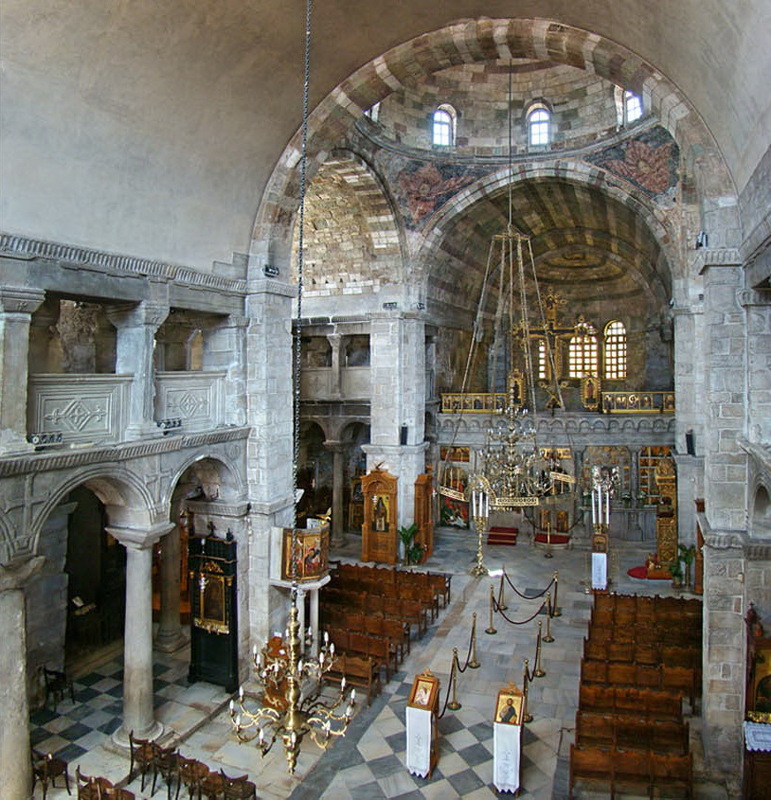 In the late afternoon, we took off for Paros, arriving there at about 6:15 p.m. We disembarked immediately as we were anxious to see the Church of Paros, which is reported to be the most beautiful and important Byzantine church other than the Santa Sofia in Istanbul. 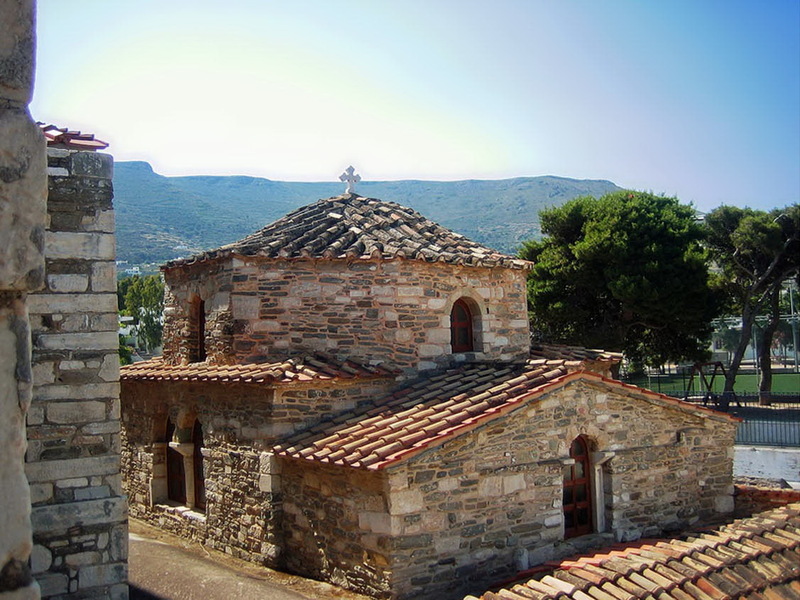 In fact, the Paros church was executed by one of the two architects that designed the Santa Sofia. The church is indeed beautiful. The vaults, columns, alter, front all have remarkable character. The structure is rather surprising in that it gives the impression of being somewhat rambling, comprising two churches and a baptistery in all. The exterior of the main building is not so impressive but the exterior of the baptistery is most satisfying. Paros was having a fishing festival that evening and the pier and all the boats, which were moored there, were flying a multitude of gaily-colored flags. On the main pier of the harbor, preparations were being made for the events of the evening. A stage had been erected for musicians and performers. There was a dance floor with many tables set around it and there were booths, which would have either food or souvenirs for sale. Before dinner, we walked about the town and I took a number of photos. After we had our dinner on the Daphni, this was made the more interesting as a boatful of young dancers were departing by boat for the main pier from where the Daphni was moored – it was picturesque and amusing – gaiety, singing and native costumes. We then went over to the crowded pier to watch the entertainment. There were a series of musical groups and singers and there were the young people whom we had seen embarking earlier doing folk dancing. There was a display of fireworks; but the most interesting illumination came from the distant shore and hillside of the island, opposite the main pier of the harbor. Here, flicking lamps had been placed following the shoreline and climbing the hills in dark. It must have entailed setting the lights for a number of miles. The effect was extraordinary—those flickering lights, the fireworks, the stars twinkling in the sky and a full moon— all these reflected in the shimmering water and the music and singing floating out over the town and harbor on the gentlest of breezes. We would have liked to have stayed longer but we retired at 12:30 a.m. as Shirley’s sore-throat was troubling her. Upon our return, Captain Andreas told us that the diehards would stay on the pier and that the festivities were far from over. We went to sleep to the sound of the continuing festivities across the harbor. This enchanting sound swept through our staterooms, carried by the sweet soft rush of the evening air. At 7:30 a.m., we were underway for I could feel a slight rolling of the Daphni as I lay in my bunk. We arrived at the island of Sifnos. The winds were starting up again and Captain Andreas suggested we go overland to another location on the island where he would pick us up, thereby giving us an opportunity to see the interior of the island. The ride from the harbor up to an old monastery on one of the mountains was tremendously interesting. We had not seen the land terraced and partitioned in this way before. Stone walls separating sections of terracing made fascinating patterns of relief on all the mountain slopes about us. The road on which we traveled was not paved. It was filled with boulders and marked by immeasurable potholes. Our driver, a young man who was born on Sifnos but had worked for a time in the U.S. and had now returned to his home, married and settled, was outgoing and greeted us by saying, “Welcome to my island.” He was skilled in driving his taxi over these barely existent roads and, matter-of-factly, confided that his Russian-made station wagon was one of the few makes of automobiles that could survive for any time over these roads. At one point, he showed is the remains of a derelict American car that just had not been able to stand up. Our visit to the monastery was well worth the climb. 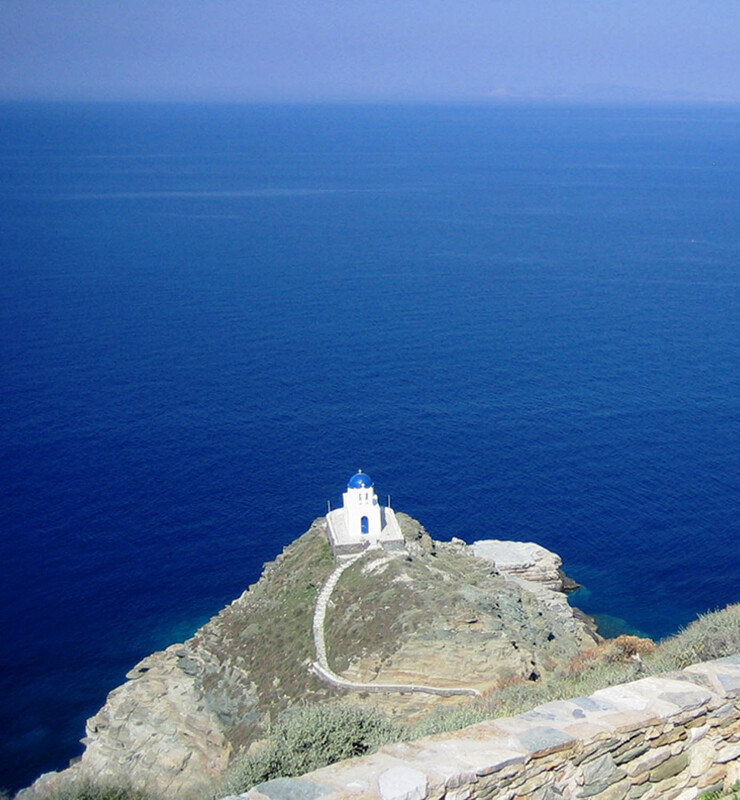 There was a magnificent view from the summit of the town of Kastro, which is situated below, overlooking the sea. The chapel of the monastery was touching in its naiveté. A child-like simplicity of decoration of the interior was contrasted with the elaborate structure of its Byzantine alter. The room in which the religious relics of the monastery were kept was equally charming. 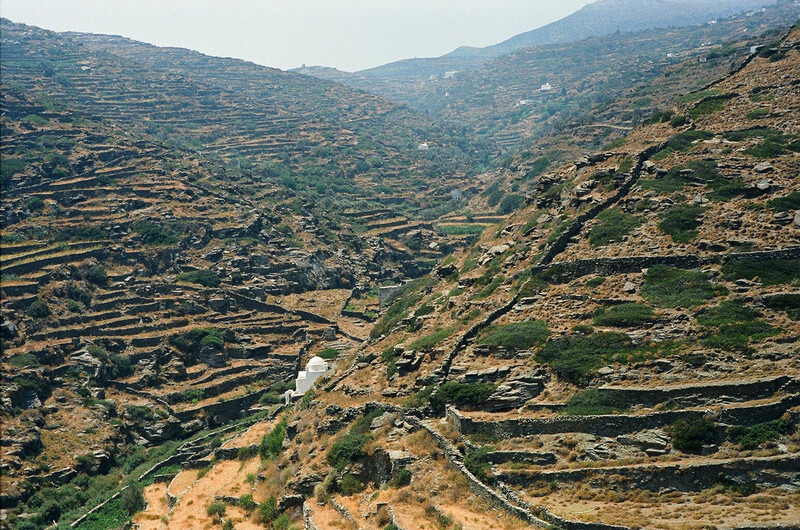 As we proceeded along this unpaved road passing endless terraces all planted with olive trees, we would glimpse livestock quietly grazing here – a great cow or bull, then some sheep or goats; occasionally a chicken hut. Farmers and their wives astride donkeys loaded down with cuttings of wood shared the road. 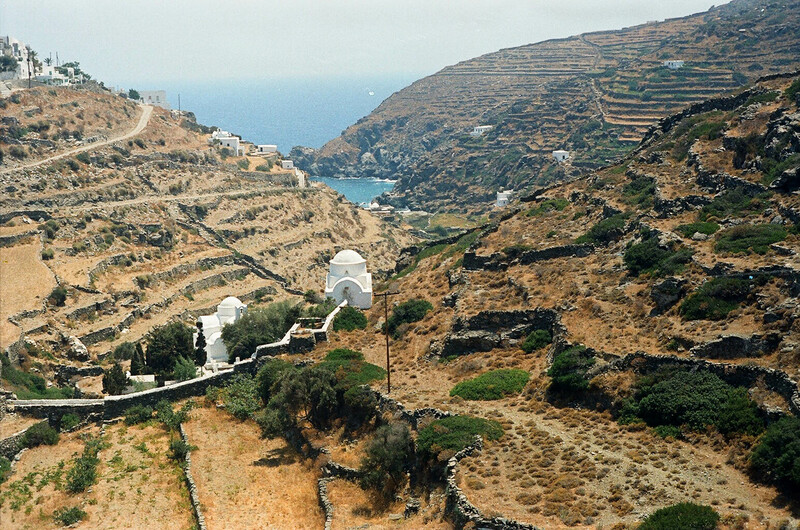 Our driver told us that Sifnos boasted 367 churches (there was one on every mountain peak as far as the eye could see and others, their blue domes glinting in the sun, dotted the mountainsides). So, the tally was 367 churches, five taxis, one bus. He did not tell us how many people inhabited the island, but we were later told that few young people remained there because it was too difficult for them to make a living. Kastro is a maze of narrow streets, almost corridors. Occasionally a narrow aperture between buildings permits a view of the sea below. It is a sheer drop and the sight of the foaming surf below is a surprising contrast to the intimate confinement of the narrow streets and irregular stairways arches and doorways that make up Kastro. The museum of Kastro is extremely modest but there were a number of fragments stored on a stone slab shelf, which I wish I could have photographed.